Eddie and Steve go Wye barbeling. 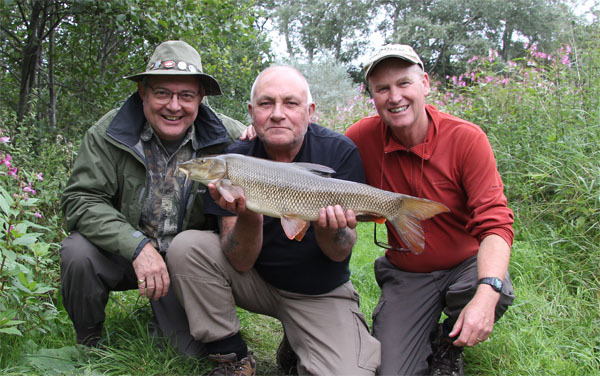 Eddie and Steve are fellow Tench Fishers and they wanted to catch a barbel or two. Steve had caught 3 from the Severn along time ago to 7lbs 12oz. Eddie had yet to fish for them let alone land one. They were down on the river Wye for a couple of days so for sure we would land a good few barbel. It had rained for the last couple of days and there was a fair amount of colour and water in the river. The height was coming up for sure and again it looked to be coming from the river Lugg. We were to fish with West Country baits pellets and feeder mix again. The sun shone at times and at others it pored with rain. However when you are catching fish who cares. 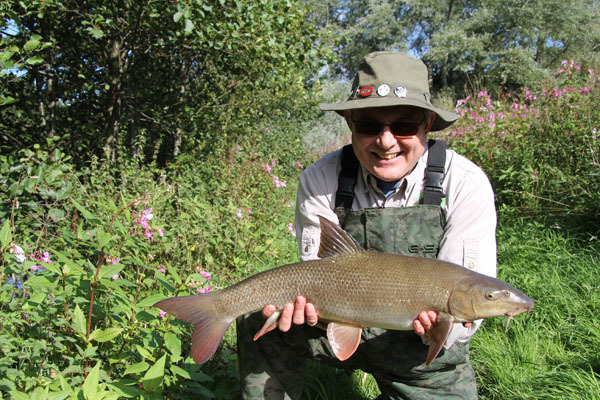 Ed was on the rods first and he didn’t take long to hook a lively splasher barbel of 4lbs 9oz his very first barbel. He just couldn’t believe what a fight this small fish gave in the fast current. Ed then had a small chub of 3lbs. Then Steve watched the rod give a 3ft twitch and he was on it like a coiled spring. The fight from this was fantastic with the clutch giving line as the powerful barbel took control of him and the rod. He did an excellent job of fighting the barbel and eventually a beautiful 8lbs 8oz new PB barbel lay in the net. Happy days. 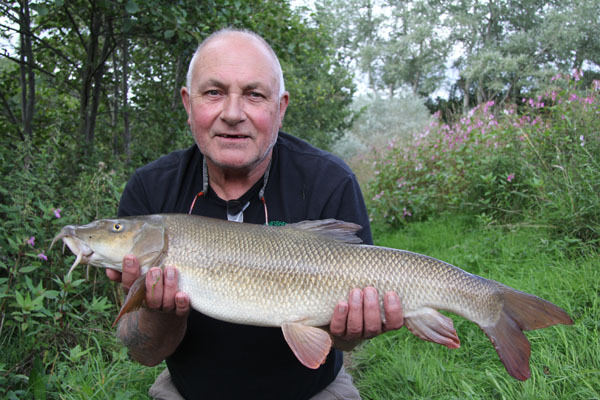 Steve was soon in the mix again and had a 7lbs 2oz barbel. It was 6pm and Ed and Steve decided to pack up at 6.30pm return to the B&B shower and head for the Pub and an Indian meal. I headed off home for dinner too arranging to meet them in the morning once they had checked out. 11 barbel and a chub for the day was not too bad. I arrived early to set up camp and bait the swims. Sometimes I use it as a little me time and I can sit back and relax. Well first cast and the rod hooped over and I was playing this big barbel that fought like hell. Now I don’t get to land these Wye barbel too often. This one was really pulling back. Eventually I landed the thing and on the scales it went 9lbs 2oz. So while I was resting it two gentlemen arrived (Steve and Ed). I was slightly embarrassed to show them the barbel and even had the cheeck to photograph it for me. We didn’t need to wait long and Ed had a smallish fish of 5lbs 5oz. 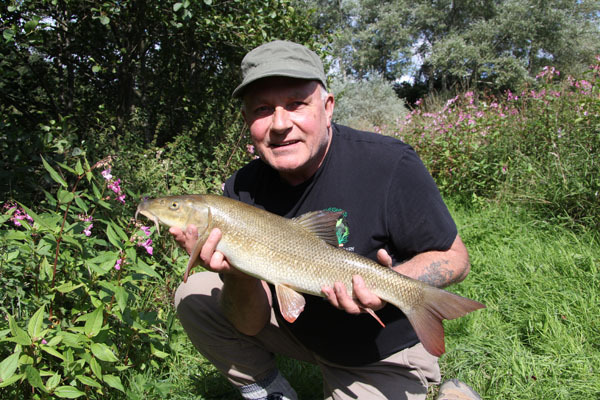 After a few others Steve caught a nice barbel of 7lb 11oz. Ed was next on the rods and he didn’t disappoint. Bang the rod went over and he was soon playing another powerful barbel. This was a beauty, and on the scales she went 8lbs 4oz. Steve and Ed kept at it. 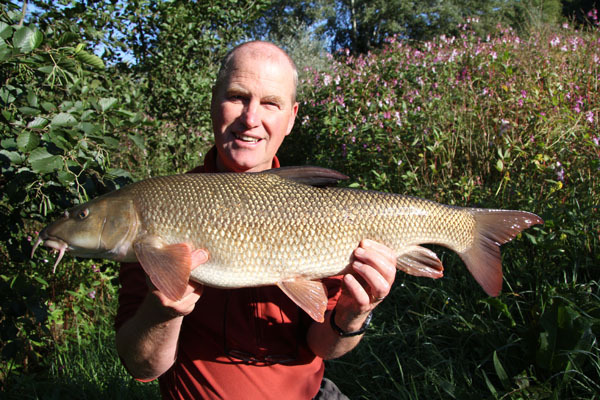 Steve had another 2 nice barbel of 7lbs 12oz and 7lbs 15oz. Ed had a 6lber in between. It was funny how they told me the story of their meal in the pub and the landlord being slightly tipsy. They had a great laugh though with the locals in the pub and knowing these the locals had a great time too. 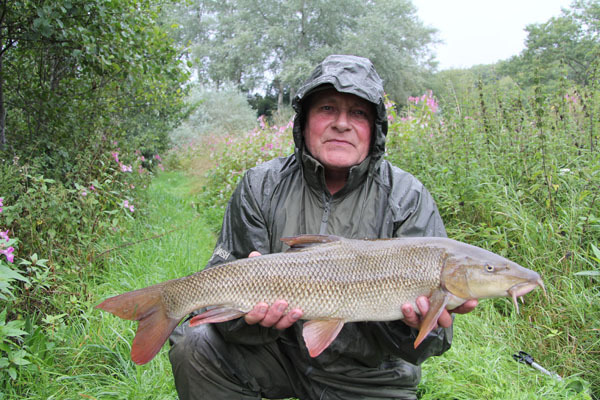 Ed was on the rods and “boom” the rod banged over and Ed fought this barbel that had him huffing and puffing a bit. What a fight from this fish. They fought much better today than the previous day. What a belting fish lay at the bottom of the net and on the scales she went 9lbs 3oz and a new pb for Ed. Steve had one more small barbel of 6lbs 8oz and it was 3.30pm in the afternoon and time for them to make that long journey home with 11 barbel caught for the day. I’m sure if they had stayed longer they would have had many more. What can I say about these two great company and a pleasure to guide. Happy days. This entry was posted on Wednesday, October 7th, 2015 at 9:30 am	and is filed under Uncategorized. You can follow any responses to this entry through the RSS 2.0 feed. Both comments and pings are currently closed.